Let’s learn to use the DART_Editor to configure a button and a potentiometer. To configure the buttons in a DART unit, start with the default PRESET, to be loaded by clicking on LOAD. then, in the Settings Box on the right of the screen, all the parameters for the selected button will be shown. Keep in mind that the setting of the same button may vary depending on the selected PAGE (top left of the screen). MODE : set this selector to BUTTON for normal button operation. it can also be set to TOGGLE and TOGGLE GROUPS, of wich a video example is given later. MIDI TYPE : defines what kind of MIDI message the button is now controlling. Note, Poly AfterTouch, Control Change, Program Change, AfterTouch, Pitch Bend. in a Note message it will be the Note-Pitch value, from 0 to 127. MAXIMUM: velocity (Data Byte 2) value at the Button_pressed action. MINIMUM: velocity (Data Byte 2) value at the Button_released action. LED : the OUTPUT number the button will be linked to, for the light feedback of the button state. 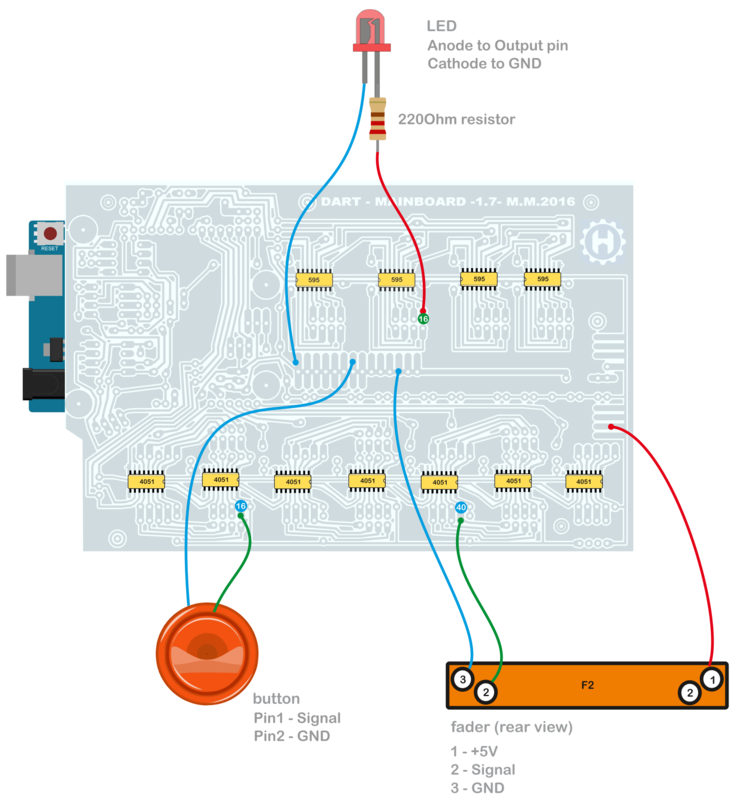 HID emulation is not available on Arduino UNO. the best way to get familiar with the many settings that can be made is to do tests and tests, always keeping an eye on the MIDIMONITOR 😉 so try to change the parameters of the selectors, upload the variations by pressing “SEND THIS” and see what happens! TOGGLE Mode : The button holds its state until the next pressure. TOGGLE GROUPS mode : The button holds its state until the pressure of another button, that is assigned to the same group. Up to 8 groups are available. We still refer to the default preset of the DART ONE unit and select one of the machine’s potentiometers (P1-P16, F1-F2). The Settings-Box on the right of the screen is now showing the POT selectors. MODE: set this selector to POT for common operation. MIDI TYPE : defined what kind of MIDI message the button is now controlling. Control Change (CC) – the most used type for pots. it is the identification number of the message, ranging from 0 to 127. MINIMUM / MAXIMUM: the pot range can be restricted or inverted. HYPERCURVE 1 – the maximum value is reached in a reduced range, from Left to Mid position. CENTERVURVE 1 – the center value between Min and Max (64) is fixed in a small portion of the pot excursion. CENTERVURVE 2 -the center value between Min and Max (64) is fixed for a bigger portion of the pot excursion. BUTTON setup in a DIY circuit. 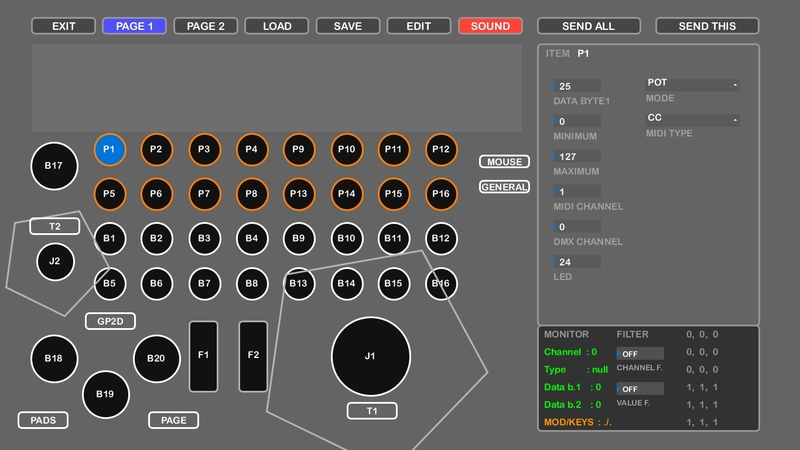 Run the DART_EDITOR and connect it to the machine MIDI ports. Select the modifier n.16, in the Modifiers_Area, because the button we want to setup is connectet to the INPUT pin 16. Click on the MODE selector and choose BUTTON, in the Settings_Area. All the Button settings selectors will appear. Set the selectors as in the following image and click on SEND ALL to upload the complete preset. Always do SEND ALL for the first Preset upload. by pressing and releasing the button, the MIDI_MONITOR will show that a NOTE message 64 is received on Channel 1 with a velocity that alternates from 0 to 127. POTENTIOMETER setup in the DIY example circuit. Select the modifier n.40, in the Modifiers_Area, because the button we want to setup is connected to the INPUT pin 40. Click on the MODE selector in the Settings_Area and choose POT, so the desired selectors will appear. Set the selectors as in the following image and click on SEND THIS to upload the POT setup only. 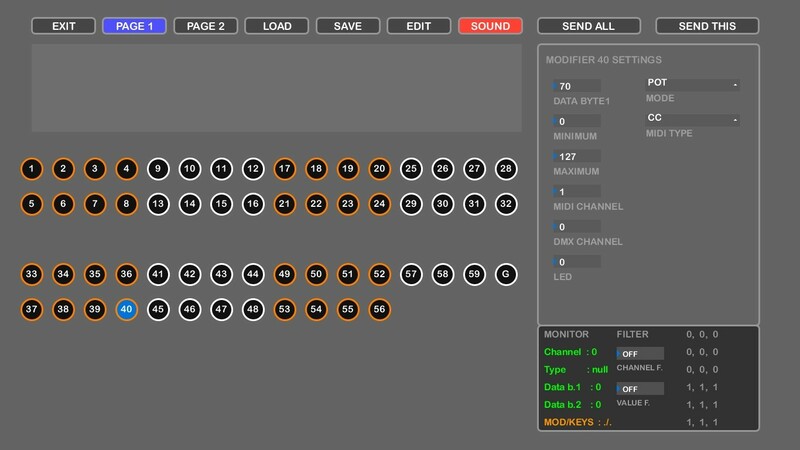 Test the pot settings by tweaking the potentiometer, so the MIDI_MONITOR will show that a CC 70 is received on Channel 1 with a Data_Byte_2 value that ranges from 0 to 127.